Before I became a travel writer at the Ultimate Travel Writer’s Workshop, my 9-to-5 existence involved working as a corporate recruiter in the architecture and engineering fields. That meant spending the bulk of my day reviewing resumes and discussing job descriptions with engineering managers. Prior to my business card reading “travel writer,” my sexiest day might include describing how a candidate’s skillset designing sheet metal enclosures was just what an employer needed. Compare this with my travel writing itinerary for last week where I spent the day sailing on a 36-foot catamaran in the Bahamas—and I didn’t pay a nickel. So, how did my before and after happen? The seeds to my travel-writing story were planted when I attended the Ultimate Travel Writer’s Workshop in 2011. I remember my excitement surging as I listened to editors and writers share their success formula secrets. The map pointing toward my travel-writing path was sketched at this workshop in the form of two different, yet integrated, directions. I felt that golf writing was one path in which I could succeed and keep my interest perpetually high. I took a blind leap of faith that golf would provide an abundance of travel article possibilities. Eight years later, my naïve assumption proved to be 100% correct. Golf writing has launched me from my hometown in Minneapolis to exotic locales such as Panama, Costa Rica, Turks and Caicos, Anguilla, Punta Cana, the Riviera Maya, the Canadian Rockies, the Bahamas, Hawaii, Los Cabos, and many points in between. This week, I’m anticipating golf press trips to Hilton Head, SC, and Spain. The second cornerstone to my personal odyssey was diving headlong into a Caribbean writing niche. White-sand beaches, turquoise water, palm trees, and the occasional rum punch are sensory buttons that I love to engage. 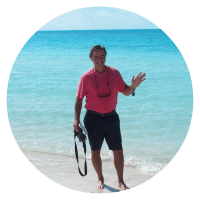 An oceanfront hotel, resort, or villa stay is a travel writer’s reward that not only captures my imagination, but also has a writing niche with a massive audience. This writing specialty translates to a win-win for me as a writer and for many of the editors to whom I pitch these island stories. Why does travel writing work for me? I can’t think of another vocation that gets you out of bed with more zest, more anticipation, and more childlike wonder. Each new destination, interview, or spontaneous occurrence is steeped with the potential for awakening a great story that you have the privilege to share.